tBoW webmeister Dr. D posts these thoughts on a recent research publication that has received a bit of press. Several reviews follow that further investigate these findings. “Perceived added value” is a term used in marketing that describes how a consumer might look at oh, say a bottle of shampoo with two free ounces for the same price as the smaller sized bottle. You get more for the same price, thus there is the perception of added value or better bang for your dirty-hair buck. In this case, the perception of added value is actually true, you get two more ounces of product for free. However in many product categories, the added value is only perception, nothing tangible. When it comes to the price of wine, it is often about perception, not a tangible value. This is the essential reason for our “No Wine Over $20” call to arms. A recent study performed by the Stanford Graduate School of Business and the California Institute of Technology, published in the Proceedings of the National Academy of Sciences shows how the perception of wine enjoyment actually arises from a different part of the brain than where tastes are registered. In this study, participants were given two wines to sample. One was a high priced wine and the other was a low priced wine. At least that was what the participants were told. In reality, the two beverages were identical. It’s kind of like a reverse placebo. Instead of giving two different pills that masquerade as the same medicine, we have two identical wines that are being presented as different vintages. Brilliant. As any marketer could predict, the perception of the more expensive wine received higher marks for “enjoyment” than the cheaper wine. This is a classic example of “perceived added value” and one reason you can find two products in a grocery store that list identical ingredients (with presumably identical quality) but have two very different prices that no doubt resonates with their packaging. Perceptions are hugely important in how we make our purchase choices. To put this more simply, the default setting in our brains is that if something is more expensive, it must be better. Obviously, this is a glitch in the human psyche that is easily exploited by marketers. Interestingly, the study also tracked which part of the brain was effected by the expensive wine. Expectations of quality triggered activity in the medial orbitofrontal cortex, the part of the brain that registers pleasure. This happens even though the part of our brain that interprets taste is not affected. Amazing, but not surprising. I think that what we need is a pill to stimulate that part of the brain that registers pleasure. The only problem is that it would have to be very expensive . 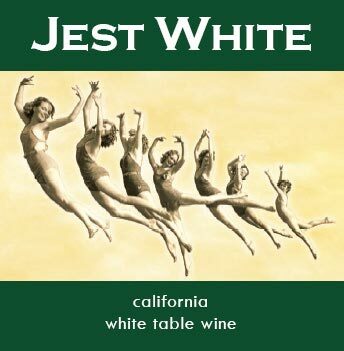 2006 Jest White $0.99: Could this be the ultimate perceived wine value? At a recent party I attended I found myself sitting next to a fellow wine geek named Cam. We talked some wine poop and he poured me the wine he brought. WhadoIthink? Chenin Blanc, Chardonnay, what else? Colombard he suggested. Nose is nice enough. Fruity and a little dry. Decent acid. He tells me the story. He bought it months ago for $10 at The Wine House (West LA emporium), liked it, but decided once was enough. Then he saw it at the 99 Cent Store for $11.88 a case. “Would you buy it for 99 cents”? No. I wouldn’t. I would rather pay $15 for the Robert Chadderdon Selection below. Here is what I found about Jest White on the Chowhound website. 2004 Chateau du Sueil Graves Blanc $15: This Robert Chadderdon Selection represents what I would call great value. I know I am wrong in the eyes of others. But they shop at TJs (I covered the decline of Trader Joes in my October 25 07 entry). In fact Cam pointed me to the Quaffability blog where TJ wines are reviewed saving lots of wasted $$ for folks who buy wine there (unless they stick to twoupchuck). I covered this in an earlier post on how Costco has replaced Trade Joes as the go-to value wine retailer for the masses (snobby eh?). When I praise Costco I do so with tongue in cheek. One can buy good wines at very good value in Costco. They are just not interesting wines. This Sauvignon Blanc is perfect in many ways. It is balanced and has bright acid (lights up the mouth). Flavors are lemon peel, sour orange. Alcohol is 12.5%. I do not hesitate to push the Lincoln and Grant over at the cash register. Is this 15 times better? It is probably 50 times better. Quaffability is a wine review website that uses a sensible wine scoring system. The ubiquitous 100 point system is moronic with no real scale properties. If you never have a score less than 85 then you really have a 15 point scale. And if nobody cares about wine rated below 90 then the scale is really only 10 points. This is Dr. D’s point and one of the long grieved problems with Wine Spectator, Parker and other touts using the 100 point scale. Think about it. Explain the difference between 92 and 93 points. Isn’t this all about perception? It looks stupid to rate wine as 6 or 7 on a 10 point scale. Imagine a 1 score. Ratings in the 90s are perceived as more desirable. John G is the Quaffability taster and I have to guess the man behind the MUCH MORE SENSIBLE rating system (let’s call it the Qscore). Here is how JG ‘splains it. Cost-Price-Ratio scale? I would describe this as the Cost-Value-Ratio or the Price-Value-Ratio or even the Taste-Cost-Ratio. The $0.99 Jest White wine tastes like a $5 wine to me so its Qscore is 500%. Now we see the problem with this scale. It is not well suited for really really cheap wines. A $5 wine is already cheap. But a $1 wine is ridiculously cheap!! The $$ difference is small enough to be irrelevant. In this case, the perception of a 500% value grossly exceeds the quality value. The white Graves costs $15. It tastes to me like a $25 wine. Its Qscore would be 167%. 1997 George Breuer Rudesheim Schlossberg: This wine was dumb for a long time. It started to come around in the past year. This is a legendary winery. 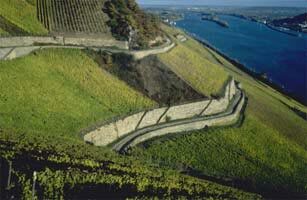 Riesling is my favorite wine in the world. They age wonderfully. And nothing else tastes like Riesling from Germany. While I favor Mosel wines I have tasted wines from other regions in Germany such as Nahe and Rheingau that are delightful. This 10 year old Reisling is yellowing although there is still a touch of green present. The nose has petrol (which is characteristic of Riesling although with great Mosels it seems to disappear) and baked bread. The flavors are exotic. Lime, soda crackers, arugula (bitterness) and a creaminess that is fighting to be released. It is almost gaseous. Who left the stove on?!?! I love it. Small production of 300+ cases. Classic. And the Qscore? I like to drink young Rieslings but I love to drink properly aged Rieslings. I prefer Ausleses. I really do not have a taste any more for the super sweet BAs and outrageously sweet TBAs. I would love to have my 1983 selections back. I am sure they still defy gravity (like the photo above of Berg Schlossberg vineyards hanging over the Rhine) and to me might as well be priceless. Stumpfy says that reisling is his favorite wine in the world. If given a choice of a ’90 Musigny or a reisling of his choice, would Stumpfy opt for the ‘da white wine? Would Stumpfy take a polygraph on dis? All of me love – le Roi. Everyone knows polygraphs are pseudo-science. However, a 20 year old Mosel GKA can be magical. How could anyone resist a 1990 Musigny? As long as the producer ain’t Esmonin. Read Mouse’s new takes on white wines in da big apple.